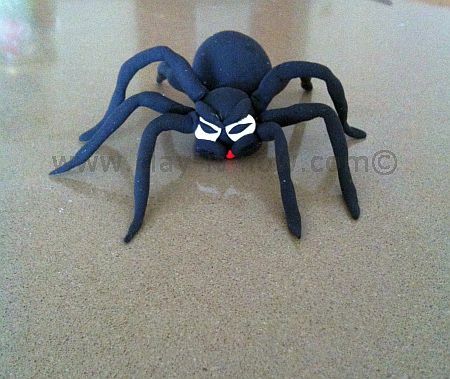 I've made friendly spider with a hope that it can be used for home decoration or cake topper. Don't be surprise that many people keep spider as pet though. Creepy? not for some. We live in Australia, so spiders are kind of everyday thing. We saw it everywhere especially underneath the boxes in store room and garage. Some poisonous though. Be careful of them if you are not sure. Condition your clay. Recommended clay would be soft clay from Crayola, Cloud, Hearty. 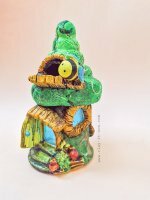 Check out our "what clay to buy" page for more info. 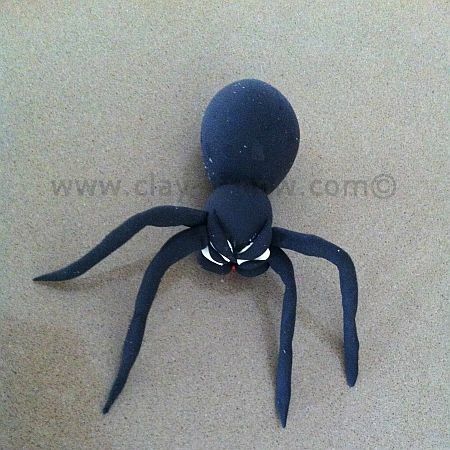 We use squishy kids clay here, but If you want the spider becomes hard when it's dry, you can use store bought air dry clay or homemade clay such as cold porcelain, soapy clay or no cook play dough. 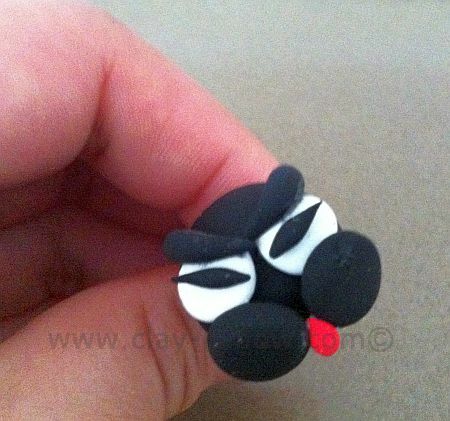 You have to paint your homemade clay with acrylic or oil paint to get strong black color. Alright! 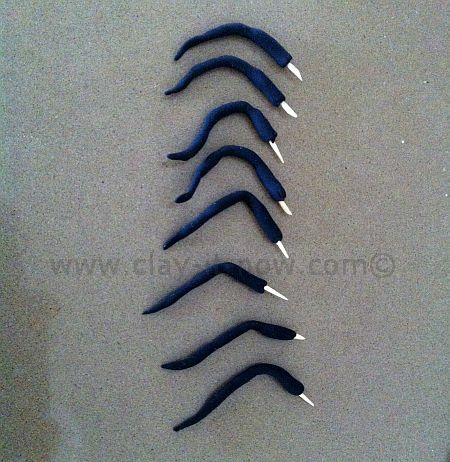 back to our modeling, you can start rolling your black clay now. 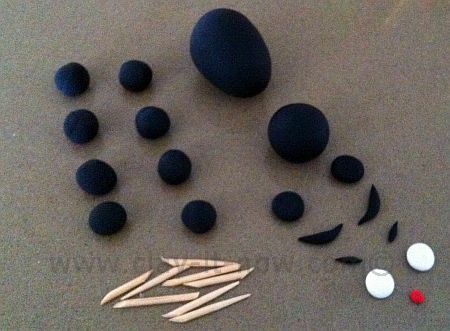 Prepare 1 ball shape clay with diameter about 11/2 cm for the head, 1 oval clay shape for the body, 8 balls shape with diameter less than 1 cm for the legs, 2 flatten round shapes for cheek, 2 small tapered sausage for eyebrows and 2 smaller tapered sausage for the eyeballs. 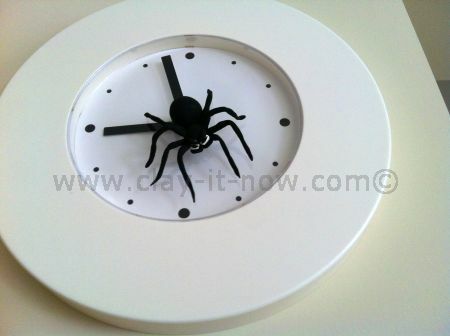 Also, prepare 2 flatten round shape clay in white color for the eyes, 1 small flattened oval clay shape in red color for mouth, and 8 pieces toothpicks cut in short length to insert the legs to the head of the spider. 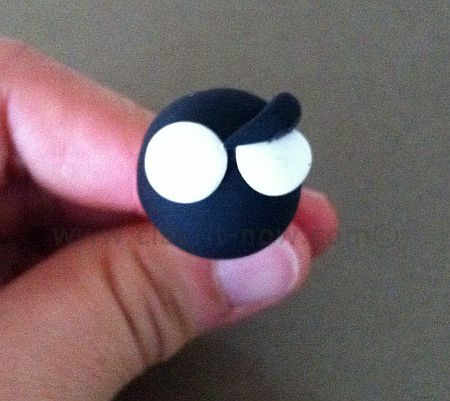 Use toothpick to hold the head and start attaching the eyes and other facial features. You can add white glue if necessary. Complete the facial feature and let it dry. Roll 8 balls clay shape to pipe or spaghetti shape and sharpen one of the edge. Flatten the sharp edge. Tips: make the spaghetti/ pipe shape uneven in diameter to make the legs look natural. Attach the head to the body. And then attach the legs to the head start from front legs. Ta da.. here is our friendly spider! Happy modeling. Create spider web pattern on top of your cake and place the spider on it. Cool?